Cookie's Embroidery and Sewing Creations: Fun with Coffee Addiction! I am a firm believer in combining my hobbies. Scrapbook making, embroidery, sewing and photography all work so well together. But I left out my love of coffee. In thinking of a project for this month's newsletter, I decided on this In-the-hoop Coffee/Tea cozy while over-heating my fingers on a hot coffee cup at my favorite stomping ground. The moment of inspiration came to me as I could not locate the brown "wrappy" things! So why not carry my own? With the power of sewing, embroidery and computer technology, I quickly went to work. I used white thread on a white floral background printed fabric, to achieve quilting (for heat absorption) without battling the flowers. And if you rotate the cup, there is actual embroidered lettering on it. Such fun and easy to do. A solid fabric would be a great choice so that the wording could stand out and make a statement. But I chose to integrate my words subtly and blend them into the decor. Read this month's newsletter available to all subscriber's of cookiescreations.com. 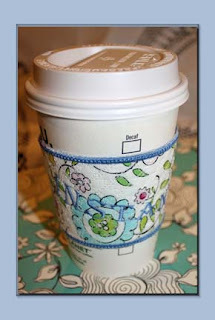 Included is the design file and the how to directions to create your own embroidered In-The-Hoop Coffee/Tea Cozy. Only available for free during the month of August. The subscription box to join is located on the home page of the website.